Zoey is three years old and has been having several types of seizures since she was about three months old. In November of 2013, genetic testing revealed that Zoey had the SCN1A mutation, and she was given a diagnosis of Dravet syndrome. As people in this country and around the world are becoming increasingly aware, Dravet kids do not often have a positive outcome when using traditional methods to control their conditions. Regrettably, Zoey’s doctors saw fit to experiment with her using several dangerous medications including a sodium channel blocker named Depakote. Depakote can actually increase seizure activity and cause many side effects when being used by a child with a sodium channel mutation. These medications were prescribed to Zoey even when genetic testing was ordered because a sodium channel mutation was suspected. This is actually a typical situation going on across the country for thousands upon thousands of epileptic children. These drugs can already be harmful enough on their own, even when used for the intended conditions.. Many of the seizures that Zoey had would land her in the Emergency Room, only to be air-lifted to another hospital. She has stopped breathing several times and has been put into medically-induced comas in order to stop the seizing. The helplessness a parent feels in these situations can only make or break you. It is terrifying, it is heart-breaking, and it is infinitely traumatic to witness over and over and over again. Fortunately for Zoey, her mother could not accept that there was no cure for her daughter’s condition. Lindsay immediately began researching alternatives for her treatment hoping to find something that could help her daughter. Not surprisingly, information about the strain Charlotte’s Web came up in keyword searches. Lindsay was able to see that other parents and providers were having success at rebuilding and protecting the brain and preventing epileptic seizures in Dravet kids using cannabis oil. The more she learned, the more realistic it became to consider that Zoey could live the rest of her life like many other kids and be able to run, to play, to learn, to show love…Lindsay believed it was possible for her daughter. And she was determined to make it happen. Over six months after originally receiving the diagnosis of Dravet Syndrome, Zoey had both of the doctos’ recommendations required for parents to be able to use cannabis legally to treat their child’s qualifying condition in Michigan. After obtaining cannabis oil made from a high CBD strain, Lindsay was confident that Zoey was on her way to getting better. She began using the oil with Zoey for three weeks, hoping for success. And when the CBD oil didn’t work, Lindsey did not give up on cannabis. Lindsay found us in June through another Michigan Mom whose four year old with a diagnosis of Dravet and Autism was seeing over a 99% seizure reduction with us. This Mom also saw accelerated development and communication using whole plant therapies. Having clearly not been affected by the dangerous and irresponsible idea that THC shouldn’t be used with children, Lindsay was open-minded to using whatever doses and ratios we recommended for Zoey. Zoey and her Mom just recently celebrated another forty consecutive seizure free days and huge developmental gains using cannabis oil that is higher in THC than CBD. The seizure that interrupted Zoey’s latest green streak was minor, at that. Within minutes of the onset of the seizure, Zoey was back to her smiling self, possibly even unaware that it had happened. Before using these medicines, there were not many seizure free days for her. If Zoey had too much fun, she could have a seizure that would send her to the Emergency Room again. Contrary to what many parents would expect, these higher THC ratios do not get Zoey stoned or high. In fact, they give her more energy than she’s ever had in her life while still helping her to sleep through the night and avoid seizures. Why paint the picture with words though when Lindsay was thoughtful enough to provide pictures of Zoey from before and after she started using our medicines. We send our gratitude and appreciation to Lindsay and Zoey for sharing their beautiful story and photos so that others can have a chance for a similar opportunity with their own children. These kids are the future, let’s free this plant and get them off these drugs! ARE YOU INTERESTED IN BEING A PART OF THE PARENTS 4 POT LEADERSHIP TEAM? 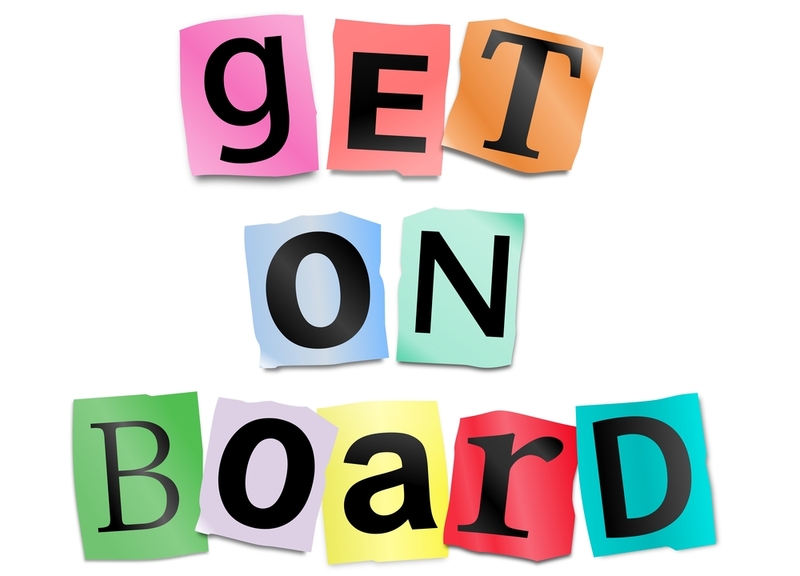 Parents 4 Pot is expanding their Board of Directors this year and adding four new active positions. We are looking for folks with approximately 5-10 hours a week to donate to furthering our mission. Candidates can email a short letter to parents4pot@gmail.com explaining why they would be a good fit for the available position. Please put the position you are interested in as the subject line. We will be taking submissions through February into March, and making selections in late March. We are excited to expand our horizons in the coming year and look forward to you being a part of it! We appreciate all of those interested in these positions and look forward to your addition to our team of activists ad advocates focused on "Ending Prohibition One Family at a Time." I am always amazed at the generosity of many of the folks that make up the cannabis community. When we started Parents 4 Pot a little over a year ago we wanted to make it an organization that helped find ways to directly affect the lives of families who are victims of the war on cannabis. Our mission is valid. We are here to be a dedicated voice for all families who support the end of hemp and cannabis prohibition. We strive to defeat the social stigma surrounding adults who use cannabis responsibly. We support a parent’s choice to use medical cannabis to treat their children's illnesses. Our work helps families with cannabis related issues through education, direct action and organizational support. The outpouring of support from large donors and small donors alike have enabled us to make a real difference in some families lives this holiday season and we want to personally thank those who have stepped up to make this a reality. Imagine being a kid whose dad has served a decade in jail while your family struggled, and to have gifts you want and need show up with the message "We think your dad is a hero... Love, Parents 4 Pot." Or to be a family torn apart having to move half of the family to a state with cannabis to treat your kid's disease, and struggling to make ends meet. When presents show up saying "We hope you are doing well" it is life changing for these folks. As I sit here in tears thinking about the way people have given even when they had very little to make these families holidays special, I am truly honored to know you folks. I cannot express how grateful we are to have such an amazing group of support and kindness. It truly is touching... so THANKS to all who have helped. If you still want to help there are plenty of folks on the list who you can still get presents for directly through Amazon at parents4pot.org. If you want to donate funds directly through PayPal you can do that with the email parents4pot@gmail.com. I can assure you it will make you feel better and that your funds will go towards a noble and just cause. We are appreciative beyond words. Support the Parents4Pot Second Annual POW/Cannabis Community Holiday Drive! We love to make a difference in the lives of those in our community. No one knows first hand how terrible this war is than the families of those who are struggling to make ends meet in their role as an activist, medical refugee, or those serving time for cannabis. We are organizing Amazon.com Wish Lists for each POW’s family. We hope you will chip in a few bucks to send a gift to a kid whose family is paying the ultimate price from the drug war. There are gifts of all shapes and sizes. Feel free to choose some gifts that are within your budget, or you can donate directly to the P4P Holiday Drive by PayPal. Send your donation to parents4pot@gmail.com with “Holiday Drive” in the memo/notes section. We will select presents for families on the list for you. We appreciate the support and are overwhelmed by the generosity of this community. Together we can ensure our community stays strong and that those less fortunate have a wonderful holiday despite life’s many challenges. Feel free to contact us directly with any questions you may have, and again… THANK YOU! If you know of a family who could use some help but is not listed here, please let us know in the feedback section below. We need the name of the family, the kids names and ages, what they would like for Christmas (clothes, backpacks, video games, music, movies, etc.) and where we should ship it too. Also send us some information about the hardship situation. The preceding text was originally published on the Parents4Pot POW Holiday Drive webpage, which can be viewed here. The Parents4Pot site includes pictures, backstory, and wishlists for the POW/cannabis community families that Parents4Pot is organizing the drive for this year. So far, that list includes the family of Luke Scarmazzo, sentenced to two decades in prison, Jaqie Angel Warrior and her family, the cannabis refugee family of young patient Cyndimae Meehan, and the families of POWs Weldon Angelo, Ricardo Monte, and Chris Williams. Check back on the POW Drive page often, as more will be added. Share the site and this article with those who are in a position to give and those who could possibly benefit from knowing about the drive! It is a tragic fact of the War on Drugs that some loving, dedicated parents who never hurt anyone will be spending the holiday season incarcerated, far from the ones they love. Thanks to Parents4Pot for organizing this beautiful community giving opportunity for the second year in a row, and for bringing much-needed attention to the damage the War on Drugs is doing to otherwise happy, healthy families. For previous Ladybud coverage of the amazing activism efforts of Parents4Pot, click here. Medical Cannabis Patients, Families and Supporters to Protest Massachusetts Department of Public Health on Tuesday, October 14th to Let Them Know Their Inaction is #UNACCEPTABLE. Protest, Press Conference, and Solidarity March. Boston, MA, October 7, 2014 – On November 6, 2012 Massachusetts residents voted overwhelmingly to allow citizens to have access to medical cannabis. Nearly two years later the will of the people has still not been implemented and patients are still forced to go without cannabis medicine, or to seek it out from often dangerous black market sources. It is unacceptable. The program has been hampered by incompetence and seemingly political positioning. The DPH received millions of dollars in fees to vet applications, and failed to do so. It took media sources reviewing the applications and publicly acknowledging their shortcomings to realize many inconsistencies and politically charged issues. The DPH was forced to delay the program and rescinded nearly half of the original 20 dispensaries that were selected for approval. Because of their inability to review the most basic of issues in the applications, this has resulted in them dragging their feet resulting in thousands of patients being forced to suffer needlessly. To date, patients still do not even have a simple identification program for law enforcement to verify their patient status. The planned caregiver program is non-existent due to cumbersome and unnecessary regulations. Patients cultivating their own cannabis have no way to know if their gardens are legal or if they are violating the law, as DPH has no guidelines or registration. Dispensary groups approved for the inspection phase continue to be limited by unsure direction and confusion from the DPH. Patients with serious and life-threatening illness are being denied access and are suffering diminished quality of life (and even death) as a result of the State’s failure to implement the program. This is no longer okay and we demand the Department of Public Health immediately begin to open up the program and allow for patients to access safe and quality cannabis medicines through experienced caregivers able to serve multiple patients; and clean, well-lit dispensary facilities. We demand DPH limit restrictions on hardship cultivation and allow more patients the opportunity to grow their own safe medicine. We demand the DPH expedite the current dispensary applications waiting for approval, immediately issue permits in counties without access as required by law, and allow for at least 35 dispensaries statewide to serve the needs of the tens of thousands of Mass residents who qualify for medical cannabis. Hundreds of patients and activists will gather on October 14th to make these demands heard at the MA Department of Public Health offices in downtown Boston. 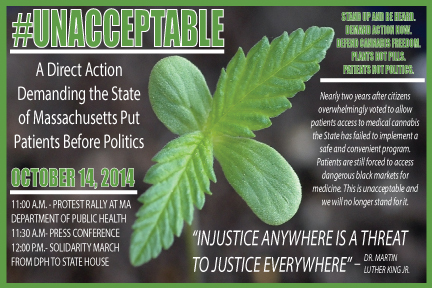 What: #UNACCEPTABLE: A Direct Action demanding the State of Massachusetts put Patients before Politics. Why: To demand the DPH and state quit putting politics before patients and implement access to medical cannabis immediately. To bring public awareness to a cause that has forced people to suffer needlessly, including children and families dealing with major health issues. To call for immediate change and progress. The Global Cannabis March is my personal activist anniversary. I attended my first march in Portland, Oregon in 2001. I volunteered to register voters that day. The March, the speakers and talking to people about why cannabis should be legal fanned an ember inside of me. Thirteen years later, that ember has become a passionate fire that won’t be quenched until prohibition is over. Even though legalization is right around the corner, many women today are afraid to talk to their doctors about cannabis use while they are pregnant. There was a study done in Jamaica that shows it is certainly not harmful. We also have new information that shows that mothers' milk contains cannabinoids. Each of us need to decide whether or not to talk to our doctors about our cannabis consumption; it is a very personal decision. Here's what happened to me.